What store is that in? I mean, not that I want to buy it. it's in the perfume store in harvard square, the one across the street from crate and barrel. 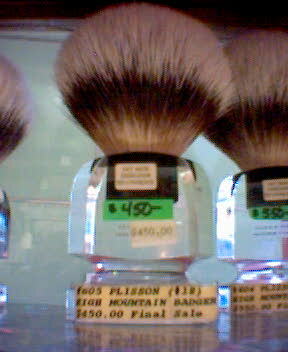 Hell, you can get a real "Muehle-Pinsel Olive Wood Handle 23mm Handmade Badger Shave Brush" for only $64.95?!?!? http://store.knifecenter.com/pgi-ProductSpec?TB93H13 The brush shown isn't even an authentic "Muehle-Pinsel"!! (LOL, why does that sound like something from a Monty Python skit? ).